Rule with fairness as you watch over your domain. Be calm and attentive, but don’t make decisions until you understand the entire story. There are little details hidden in the shadows that you’re going to need to be aware of. Take time to look for them and then you can make informed decisions. It’s not a day for contracts, promises or even verbal agreements. So if you can put off decisions until tomorrow, you may want to do just that. It will give you time to read the fine print, research issues or similar agreements, and make sure you have all your bases covered. Some hidden facts need to be uncovered before you dive into long term agreements head-long. Understand the full scope of what you’re agreeing to before you shake hands, sign your name and pop the cork to celebrate. Getting out of a contract is equally important is what you’re getting into. So you may want to make sure you have an exit strategy. Some details may simply be obscured and uncovering them will make the picture bigger. They may not change your mind about the decision you’ll be making, but they could uncover fine print that you want removed and don’t want to agree to. Removing it now will save you a good deal of trouble later. And some details could be hidden from you on purpose, because they are not be in your favor at all. Don’t rush through reading contracts or letters of agreement. Don’t let others pressure you into signing contracts or making agreements until you have read all amendments and subsections. If they’re not willing to wait, then you should know this may not be a good deal after all. Bottom line, don’t be rushed into something you’ll regret later. Remember you are responsible for your own domain. Don’t lay today’s decisions in someone else’s hands. Be accountable and take charge of what you need to address. You wanted to rule your world. Be vigilant and take on the work that comes along with that and you will rule with dignity and pride. You can order a personal reading from Spring through the Services at Spring’s Haven. We offer both in-house and email/phone/Skype consultations. As a Ministerial organization, all our consultations are private and strictly confidential. 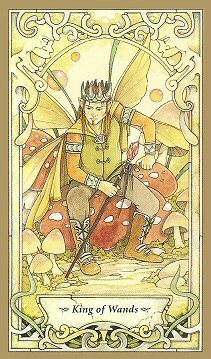 You can find the Mystic Faerie Tarot on Amazon.